This year we explore the phenomenon of nostalgia, of looking back, through the lens of Henry Wadsworth Longfellow. The poet was fascinated with heroic figures of antiquity, and he wrote sensitively, emotionally about his own life experiences and the aging process. We will also look back at Longfellow’s reputation, the ways in which his talents have been viewed through the decades. Many superb writers have graced Brunswick and its vicinity through the years. We feature twelve of them in a four-part Sunday series named for the late poet and Longfellow Days’ friend, Herbert Coursen. Each has been nominated by a poet from a prior year. We begin with Kristen Case, Maureen Thorson, and Beau Williams. Refreshments. Fireplace Room, Curtis Memorial Library. a poem. Refreshments. Merrymeeting Room, Thornton Oaks, 25 Thornton Way (off Baribeau Drive). Longfellow Days continues with Maine poets, Jim Glenn Thatcher and Sheila Wellehan, and New Hampshire’s Sarah Anderson, as featured readers. Refreshments with the poets follow. Fireplace Room, Curtis Memorial Library. Tricia Welsch, Professor of Cinema Studies, is also a passionate, prodigious reader – and she’s writing a book about it. She will share a preview of Loose Leaves, which reflects on a lifetime of reading, here talking about adult rereading of childhood favorites like Heidi and Little Women, and leading a conversation about the books we treasure. There’ll be Valentine’s Day treats. Morrell Room, Curtis Memorial Library. Longfellow Days and Pejepscot Historical Society co-host unique tours of one of Henry Wadsworth Longfellow’s residences in Brunswick – later home to Maine Governor and Civil War General Joshua Chamberlain.. Joshua L. Chamberlain Museum, 226 Maine Street. Come in out of the cold. Maine college faculty poets Derek Meader (SMCC), Ellen Taylor (UMA), and Shana Youngdahl (UMF) present their work. Refreshments. Fireplace Room, Curtis Memorial Library. Ted and Ruth Bookey facilitate an informal gathering for the area community to share favorite poems (your own or others’) at The Highlands. Refreshments. Georgetown Parlor, Maine Lodge, 30 Governors Way, Topsham. Wednesday, February 21, 7:00 PM | WE SALUTE YOU! 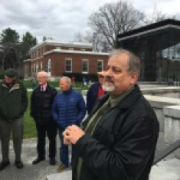 Come participate in a public read-in as we parse the quintessential “looking back” poem, Moritori Salutamos, which Longfellow wrote for the fiftieth reunion of his Bowdoin College graduating class. Gary Lawless, poet and co-owner of Gulf of Maine books, will emcee. The Brunswick Inn, 165 Park Row. Friday, February 23, 7 PM | HAPPY BIRTHDAY, HENRY! We’re cheating; he’d be 211 in four days, but who’s counting? Gary Lawless is back as our featured reader for an everyone’s-welcome poetry open mic. Come read your work and enjoy some birthday cake. Unitarian Universalist Church, 1 Middle Street. Hannaford, and the Nathaniel Davis Fund. All programs are free of charge.